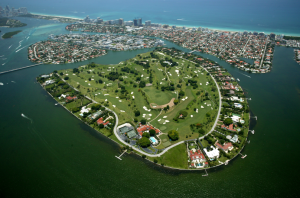 Southern Florida is gaining attention as a luxury home haven. In the Miami metro area alone, the number of million-dollar homes grew from 3.3 percent of the real estate market four years ago, to 6.3 percent in 2016, according to real estate company Trulia. Far outpacing the national average for growth in luxury home development, Miami-Fort Lauderdale boasts some of the most lavish neighborhoods in the United States. In Trulia’s report, La Gorce in Miami Beach, where rapper Lil Wayne formerly lived, was named the neighborhood with the highest concentration of million-dollar homes in South Florida as of May 2016. The neighborhood is located on the mid-beach island south of Normandy Isle and is now home to almost exclusively seven-figure houses. The number of million-dollar homes in La Gorce has increased almost 30 percent in four years. La Gorce isn’t the only Miami neighborhood drawing in the world’s elite with its luxury real estate, though. Located just off Las Olas Boulevard in Broward County, Navarrea Isle is ranked the neighborhood with the next highest percentage of million-dollar homes. As of 2016, 94 percent of Navarrea Isle houses are worth more than $1 million. The neighborhood has experienced a 42.4 percent increase since 2012. While the top five cities in the nation for highest concentration of $1 million-plus homes are all located in California—San Francisco, San Jose, Oakland, Orange County, and Los Angeles—Miami and Fort Lauderdale achieved respectable 14th and 24th place rankings, respectively, on Trulia’s list. San Francisco reigns supreme with 57.4 percent of its housing market made up of million-dollar homes, and fifth place Los Angeles’ market is 16.3 percent million-dollar homes. The Trulia report did not just rank the top cities for million-dollar homes; the list also included those at the very bottom. At the total opposite end of the real estate spectrum is Syracuse, New York, where the housing market shows no homes worth more than $1 million. In 2012, Syracuse has a 0.1 percent concentration of million-dollar homes. Trulia’s report draws attention to this growing trend, as some of the wealthiest buyers in the world begin to call Miami home. For more information regarding Miami ranks, [Click Here].